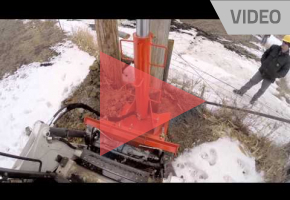 Introducing the all – new Utility Pole Puller by Shaver Manufacturing. This revolutionary pole – removing device will save you time and money by drastically reducing labor hours in the field. Simply wrap the heavy duty chain or wire rope around the pole and you’re set to extract. The Utility Puller completely eliminates the need to drill holes around the pole prior to removal, saving up to 30 minutes per pole. The Pole Puller mounts to any low – or high – flow Skid Steer and the Quick tatch plate system gets you up and running in less than 60 seconds. Pole Puller Cylinder 6” Bore X 40” Stroke with 4 – ½” Dia. Chrome Plated Induction Hardened Rod. Check out the media available for Utility Pole Puller up close in the gallery. See the Utility Pole Puller up close in the gallery.